The hundreds of things to experience and learn on The Great Trail — RandallAnthony Communications Inc.
“Having the opportunity to experience The Great Trail can make a big difference in someone’s life,” says Hugh Scott, who enjoys sharing recollections from an engagement with the Trail that spans over two decades and many geographic regions. One such memory stands out – and has been captured in a photograph. “I have a picture of my granddaughter on a giraffe [bike attachment] when she was about six or seven – now she is 14. At the time, we took a ride along the Trail right through the centre of Montreal. To me, this is a beautifully symbolic picture of why and for whom we are building the Trail: the next generation,” says Dr. Scott. Moments like these inspired the now 79-year-old avid cyclist and outdoorsman – who is also the mayor of Lac-Tremblant-Nord and a cardiologist with past leadership positions at the Université de Sherbrooke, Bishop’s University and McGill University – and his wife Paule to be the first to provide for an endowment fund as part of his planned giving to Trans Canada Trail. “After spending the last 45 years of our lives in Quebec, we think The Great Trail is a very positive way to support the issue of unity, and we want to encourage people to embark on long-distance rides or walks to get to know different parts of Canada and the people who live there,” says Dr. Scott, who believes that shared experiences and mutual understanding bring us closer together. At over 24,000 kilometres, the Trail connects about 15,000 communities from coast to coast to coast. While connecting represents an important milestone, the work is far from done. Beyond 2017, a firm commitment to the continuing evolution and enhancement of The Great Trail will ensure that Canada’s national Trail can be enjoyed not just today but well into the future. Dr. Scott – who is passionate about many things, including nature, sports, education and community-building on a local, regional and national scale – says that by supporting The Great Trail, he has found a way to combine his various interests and leave a legacy in line with his convictions. “For many of us, the mountains around the lake are something we look at and that are shown on postcards, but they are on Crown land and have been difficult to reach. With the new loop, we can experience them, and I think that’s wonderful,” says Dr. Scott. Connecting additional loops and spurs to the main Trail, and converting interim road routes into greenway, are part of Trans Canada Trail’s ongoing commitment to the Trail, which also extends to keeping the Trail in the best condition, enhancing it where possible, ensuring it’s clearly marked with quality signage and making it more accessible to seniors and people with disabilities. 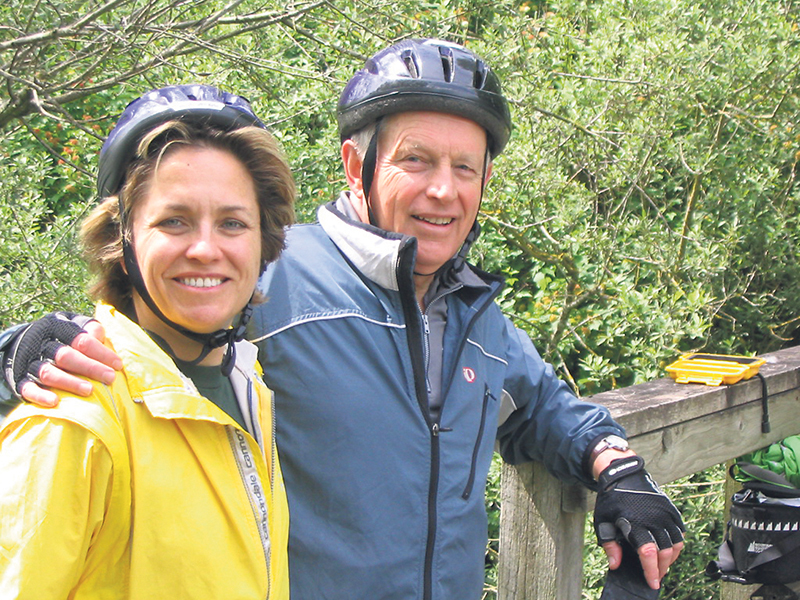 During Dr. Scott’s time on the Trans Canada Trail board, he attended meetings across the country and often combined his visits with a bicycle tour. “My eldest daughter accompanied me on a few adventures. We went for rides in Newfoundland, Alberta, British Columbia and, of course, Quebec. I actually managed to keep up with her,” he laughs. Among the treasured memories Dr. Scott shares with his daughter Jacqueline is an encounter with a drenched llama. “We were riding in the pouring rain. When we came around a corner, there was a llama, a creature you’d expect in the Andes rather than in Alberta,” he recalls. Another highlight was visiting a francophone region in Alberta, says Dr. Scott. “We were surprised to learn about this, and locals were delighted to converse with Jacqueline, whose French is better than mine. Trans Canada Trail is committed to being an excellent steward of legacy gifts like Dr. Scott’s. If you would like to leave a legacy gift or need more information, please contact Trans Canada Trail Foundation (Registered Charitable Number 82970 8403 RR0001), which will be pleased to work with your estate planners and financial and legal counsels. Please call 1-800-465-3636 or email info@tctrail.ca for more information.